The Technical Support Agent is accountable for maintaining and monitoring the computer system and networks of the company. Acting as the first point of contact for any all sorts of technical issues, these Support Agents are involved in carrying out these tasks –identifying computer problems, helping in creating user accounts, retrieving forgotten password, and logging issues; analyzing call logs, updating self-help documents so that the employees can fix the problems on their own, working with field engineers, and testing faulty equipment. 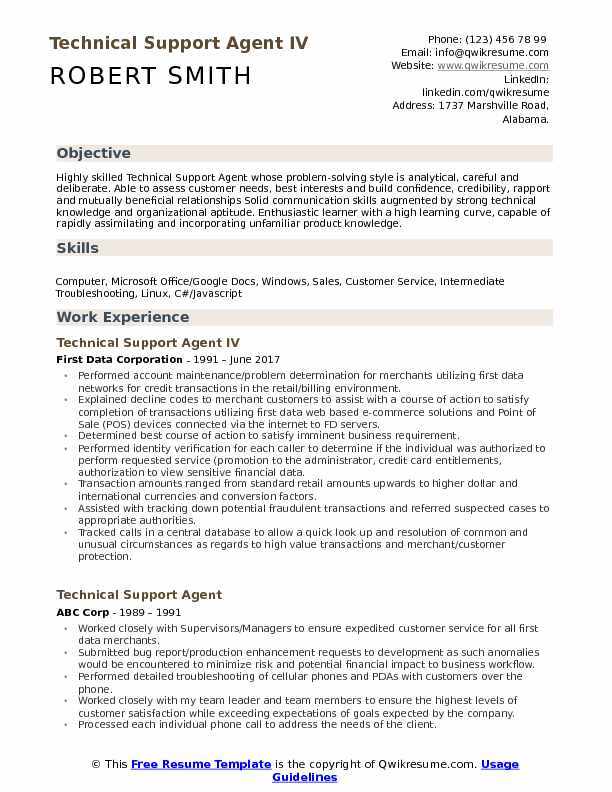 Technical Support Agent Resume even makes a mention of these duties – renewing service agreements to avoid legal challenges, improving system performance, and guiding clients through corrective steps. Apart from possessing a strong technical background, the following skills depicted in the resume will enhance better job prospects – assessing abilities, logical thinking capacity, up-to-date technical knowledge, and in-depth knowledge of software or equipment that is being used. Candidates having relevant qualifications like a degree in IT related fields along with a technical certification can enter into this role. 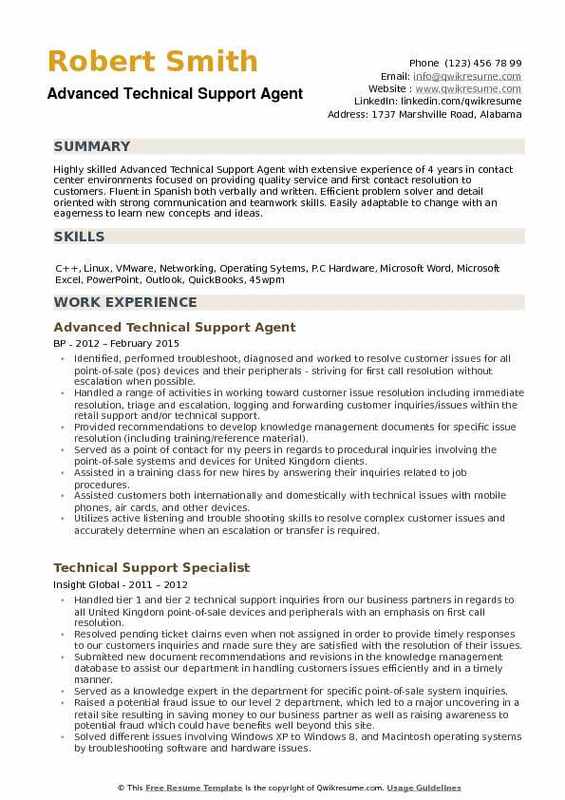 Summary : Highly skilled Technical Support Agent whose problem-solving style is analytical, careful and deliberate. Able to assess customer needs, best interests and build confidence, credibility, rapport and mutually beneficial relationships Solid communication skills augmented by strong technical knowledge and organizational aptitude. Enthusiastic learner with a high learning curve, capable of rapidly assimilating and incorporating unfamiliar product knowledge. Performed account maintenance/problem determination for merchants utilizing first data networks for credit transactions in the retail/billing environment. Explained decline codes to merchant customers to assist with a course of action to satisfy completion of transactions utilizing first data web based e-commerce solutions and Point of Sale (POS) devices connected via the internet to FD servers. Determined best course of action to satisfy imminent business requirement. Performed identity verification for each caller to determine if the individual was authorized to perform requested service (promotion to the administrator, credit card entitlements, authorization to view sensitive financial data. Transaction amounts ranged from standard retail amounts upwards to higher dollar and international currencies and conversion factors. Assisted with tracking down potential fraudulent transactions and referred suspected cases to appropriate authorities. Tracked calls in a central database to allow a quick look up and resolution of common and unusual circumstances as regards to high value transactions and merchant/customer protection. Summary : A highly skilled and analytical Senior Technical Support Agent with the broadly diverse expertise of 9 years encompassing some computer programming, computer operation, network administration, hardware, software, security system, network services, Implementations, upgrades, migrations conversions, technical support. Team member supporting and providing extensive customer service for the ATT U-verse system. (U-verse its TV internet and phone service all coming through one system a Motorola DVR or a Cisco Non-DVR. Providing world class customer service by taking ownership of each call and show customer we care, handling calls. Effectively, efficiently and confirming all issues have been addressed and handled. Providing service and expertise assisting and troubleshooting with technical installers and customers to activate the U-verse system in their homes. Troubleshooting issues tech installers encountered during installation in customers homes. Like sitting up the RGto receive the signal for the TV, and registration for the internet. Completed extensive work on the U-verse system to activate as soon as the technician complete the installation. Defusing volatile customer situations calmly and courteously, and generating necessary reports and documentation. Providing follow-up with customers, to ensure solution was satisfactory. 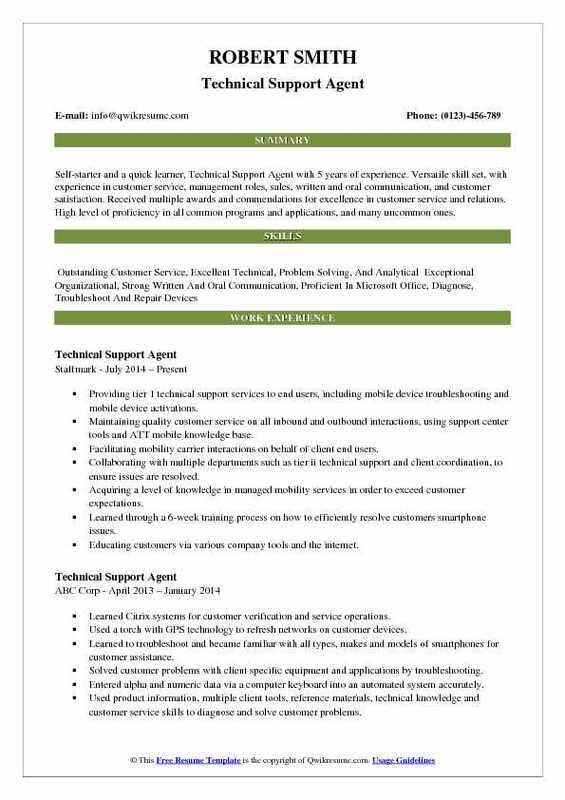 Headline : Self-starter and a quick learner, Technical Support Agent with 5 years of experience. Versatile skill set, with experience in customer service, management roles, sales, written and oral communication, and customer satisfaction. Received multiple awards and commendations for excellence in customer service and relations. High level of proficiency in all common programs and applications, and many uncommon ones. Providing tier 1 technical support services to end users, including mobile device troubleshooting and mobile device activations. Maintaining quality customer service on all inbound and outbound interactions, using support center tools and ATT mobile knowledge base. Facilitating mobility carrier interactions on behalf of client end users. Collaborating with multiple departments such as tier ii technical support and client coordination, to ensure issues are resolved. Acquiring a level of knowledge in managed mobility services in order to exceed customer expectations. Learned through a 6-week training process on how to efficiently resolve customers smartphone issues. Educating customers via various company tools and the internet. Using strict adherence guidelines to monitor time while on calls and resolving customer concerns. 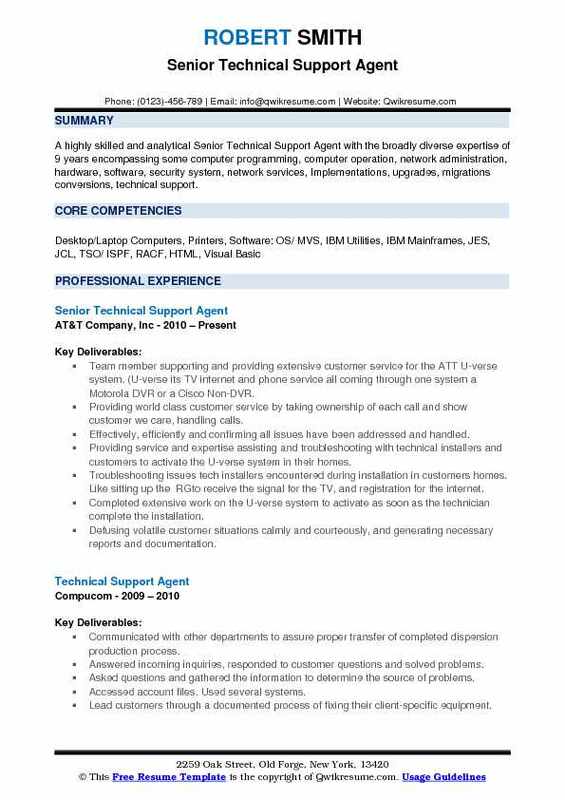 Summary : Technical Support Agent I wants to be an asset in a great company, where my 13 years of progressive experience in the industry can add value to a customer-centric team. Provided information to callers regarding warranties and replacement options. 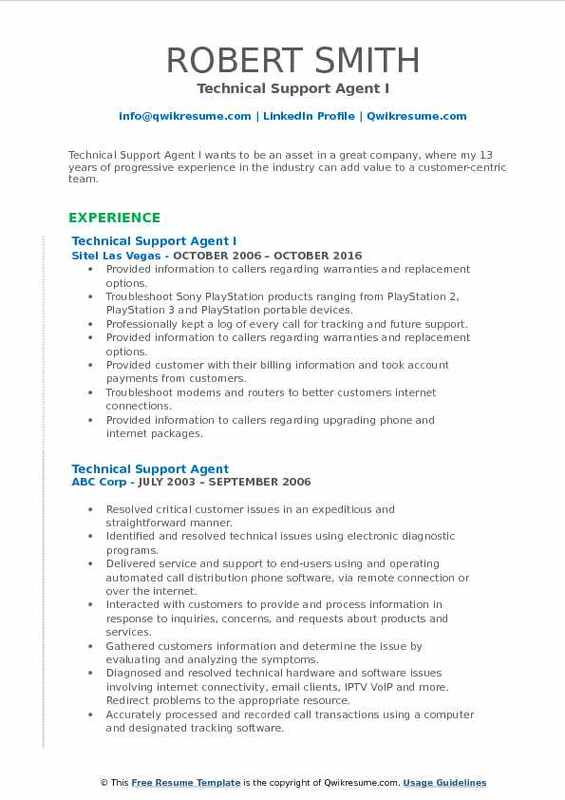 Troubleshoot Sony PlayStation products ranging from PlayStation 2, PlayStation 3 and PlayStation portable devices. Professionally kept a log of every call for tracking and future support. Provided customer with their billing information and took account payments from customers. Troubleshoot modems and routers to better customers internet connections. Provided information to callers regarding upgrading phone and internet packages. Utilized all available resources to research and solve various troubleshooting situations. Using communicative research skills to identify the cause, not just the effect of technical problems. Took initiative to stay up-to-date on the latest technologies and programs applicable to assist customer and support company metrics and goals. Headline : A customer focused professional who possesses a strong sense of urgency with regard to client satisfaction. superb interpersonal and communication skills, coupled with excellent relationship building capabilities and excellent negotiating abilities. Answering calls of customers and providing technical advice and support. Assisting customers with their concerns and ensuring they are satisfied with the support. Providing stepwise instructions on phone, online chat and through email for handling issues in mobile phones. Lending patience ears to customers, understanding problems thoroughly and advising accordingly. Recording conversion with customers and providing a reference number for issues that need personal attention. Preparing service tickets and handing it over to the customer support supervisors. Researching the required information using available resources. Following the standard processes and procedures, identifying and escalating the priority issues per client specifications. Offering alternative solutions where appropriate with the objective of retaining customers and clients business. 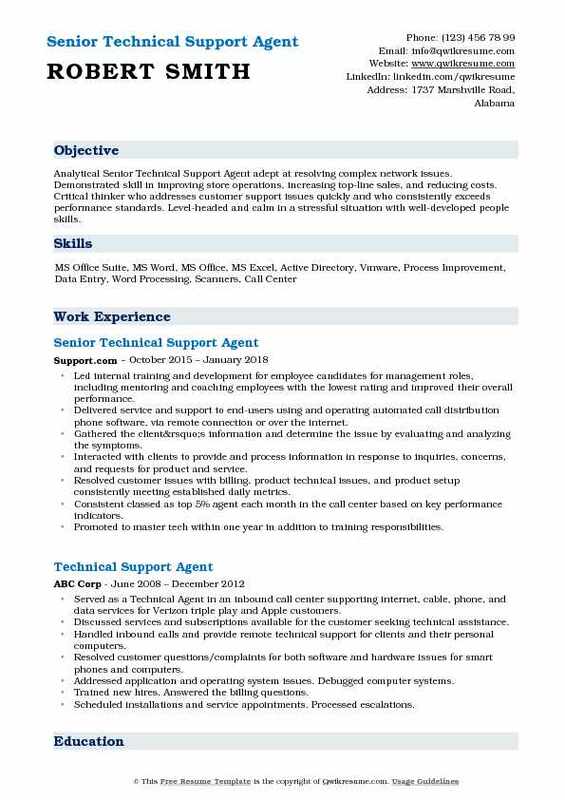 Summary : Analytical Senior Technical Support Agent adept at resolving complex network issues. Demonstrated skill in improving store operations, increasing top-line sales, and reducing costs. Critical thinker who addresses customer support issues quickly and who consistently exceeds performance standards. Level-headed and calm in a stressful situation with well-developed people skills. Led internal training and development for employee candidates for management roles, including mentoring and coaching employees with the lowest rating and improved their overall performance. Delivered service and support to end-users using and operating automated call distribution phone software, via remote connection or over the internet. Gathered the client’s information and determine the issue by evaluating and analyzing the symptoms. Interacted with clients to provide and process information in response to inquiries, concerns, and requests for product and service. Resolved customer issues with billing, product technical issues, and product setup consistently meeting established daily metrics. Consistent classed as top 5% agent each month in the call center based on key performance indicators. Promoted to master tech within one year in addition to training responsibilities. 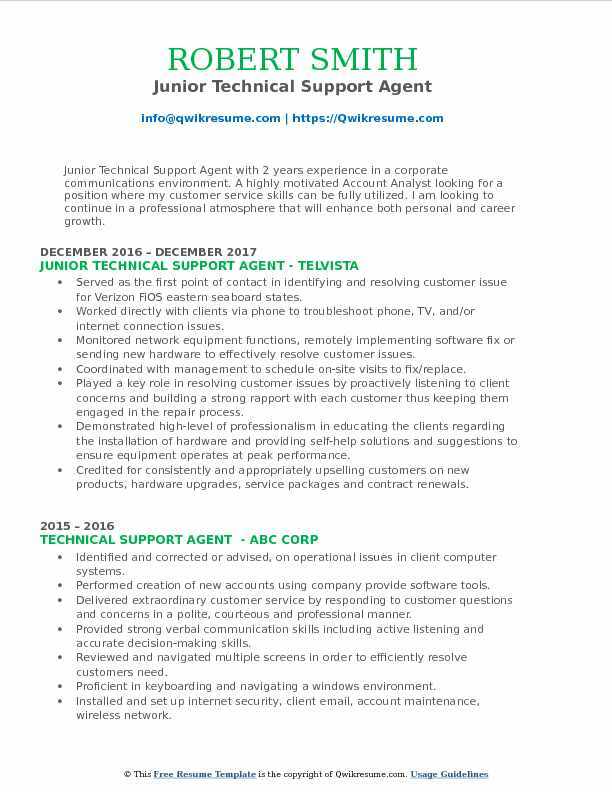 Objective : Junior Technical Support Agent with 2 years experience in a corporate communications environment. A highly motivated Account Analyst looking for a position where my customer service skills can be fully utilized. I am looking to continue in a professional atmosphere that will enhance both personal and career growth. Served as the first point of contact in identifying and resolving customer issue for Verizon FiOS eastern seaboard states. Worked directly with clients via phone to troubleshoot phone, TV, and/or internet connection issues. Monitored network equipment functions, remotely implementing software fix or sending new hardware to effectively resolve customer issues. Coordinated with management to schedule on-site visits to fix/replace. Played a key role in resolving customer issues by proactively listening to client concerns and building a strong rapport with each customer thus keeping them engaged in the repair process. Demonstrated high-level of professionalism in educating the clients regarding the installation of hardware and providing self-help solutions and suggestions to ensure equipment operates at peak performance. Credited for consistently and appropriately upselling customers on new products, hardware upgrades, service packages and contract renewals. Summary : Highly driven Technical Support Agent II who displays a willingness to demonstrate tact, good judgment and exceptional ability to establish and maintain effective relationships with supervisory and professional staff members and clients. To perform beyond expectations and complete any task assigned. Tasked with providing support for consumers in terms of navigation of our website, as well as providing troubleshooting for any issues that may arise from browsing. Also assisting with resolving payment issues, as well as modifying reservations. Helping the purchase the best package to fit the requirements of the customers wants or needs. Performing the creation of new accounts using company provided software tools. Identifying and correcting or advise, on operational issues in client computer systems. Obtaining general understanding of os and application operations related to company offered services. Providing training to clients in the use of system and applications as related to the internet. Providing client support and technical issue resolution via e-mail, phone, and other electronic media. Handling inbound tech support calls in a national call center. Using appropriate computer software tools to solve customer problems. 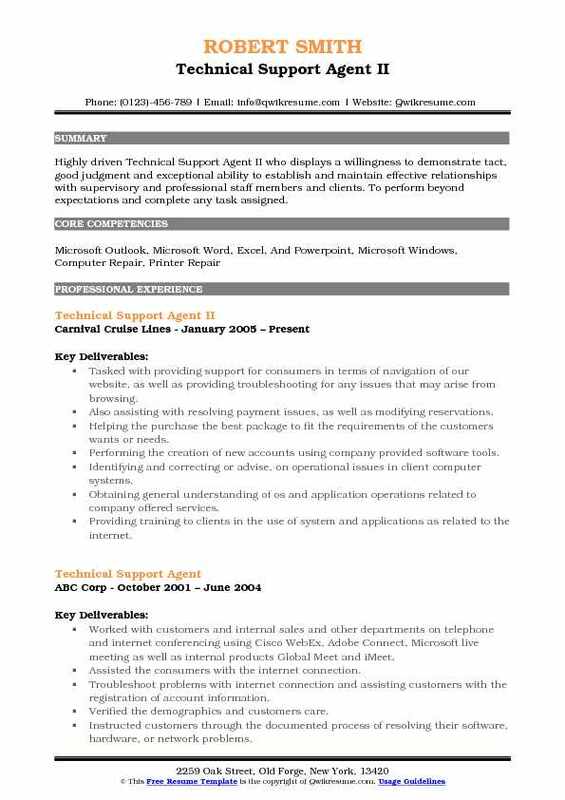 Objective : Certified Technical Support Agent with extensive experience in retail systems. Ability to troubleshoot and perform various installations for LAN and WAN networks. 3 plus years of customer service experience. 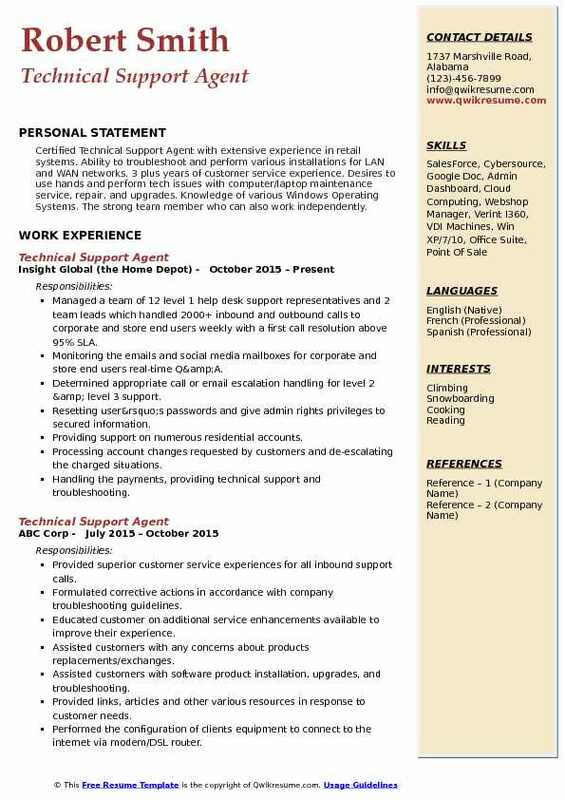 Desires to use hands and perform tech issues with computer/laptop maintenance service, repair, and upgrades. Knowledge of various Windows Operating Systems. The strong team member who can also work independently. Managed a team of 12 level 1 help desk support representatives and 2 team leads which handled 2000+ inbound and outbound calls to corporate and store end users weekly with a first call resolution above 95% SLA. Monitoring the emails and social media mailboxes for corporate and store end users real-time Q&A. Determined appropriate call or email escalation handling for level 2 & level 3 support. Resetting user’s passwords and give admin rights privileges to secured information. Providing support on numerous residential accounts. Processing account changes requested by customers and de-escalating the charged situations. Handling the payments, providing technical support and troubleshooting. Dispatching the technicians for situations requiring advanced technical issues and mediated resolutions requiring other departments. Multi-tasked various tools all while maintaining a professional phone call experience for customers who required assistance. 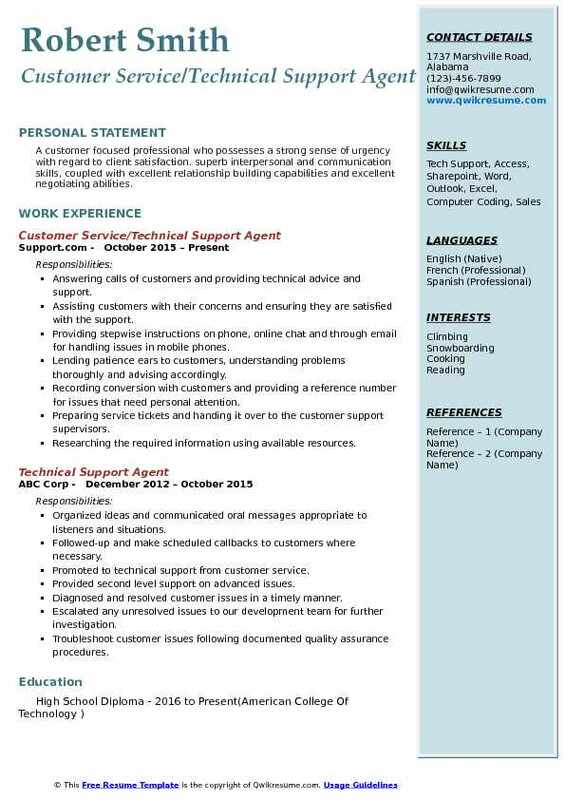 Objective : Highly skilled Advanced Technical Support Agent with extensive experience of 4 years in contact center environments focused on providing quality service and first contact resolution to customers. Fluent in Spanish both verbally and written. Efficient problem solver and detail oriented with strong communication and teamwork skills. Easily adaptable to change with an eagerness to learn new concepts and ideas. Identified, performed troubleshoot, diagnosed and worked to resolve customer issues for all point-of-sale (pos) devices and their peripherals - striving for first call resolution without escalation when possible. Handled a range of activities in working toward customer issue resolution including immediate resolution, triage and escalation, logging and forwarding customer inquiries/issues within the retail support and/or technical support. Provided recommendations to develop knowledge management documents for specific issue resolution (including training/reference material). Served as a point of contact for my peers in regards to procedural inquiries involving the point-of-sale systems and devices for United Kingdom clients. Assisted in a training class for new hires by answering their inquiries related to job procedures. Assisted customers both internationally and domestically with technical issues with mobile phones, air cards, and other devices. Utilizes active listening and trouble shooting skills to resolve complex customer issues and accurately determine when an escalation or transfer is required.